Nowadays Japanese people commonly wear surgical masks to prevent the spread of germs, as a fashion statement, or even just for a little sense of privacy. But masks have a history almost as old as Japan itself. Originally they were used in prehistoric religious rituals beginning in the Jomon period (10,000 B.C. to 300 B.C.). 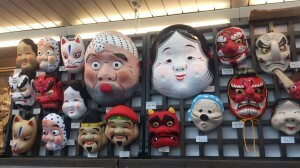 Masks are alive and well in Japan today, and you can own a piece of the tradition! But if you want to hang one on your wall, you may want to know what they’re all about when someone asks! After the introduction of Buddhism, masks took on more secular purposes such as the now extinct dance tradition of Gigaku and the Shinto-based Kagura dance tradition. Kagura, which tells the story of the origin of the gods and the Japanese archipelago is still performed today in Miyazaki prefecture. Noh theater and its distinctive masks developed during the Muromachi period (1336-1573) and influenced many other Japanese traditions, including the dramatic face-painting of Kabuki theater. 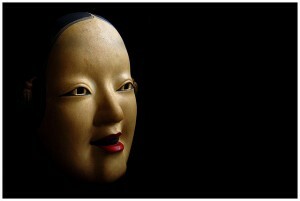 In the past there were only about 60 types of Noh masks (called noh-men or omote) used in the theater. Today, there are over two-hundred kinds of masks, culled from the same categories as the original sixty. Some masks represent archetypal characters, while others represent specific characters. There are also masks for non-human characters like demons (kijin), supernatural beings (onryo), or animals (like kitsune). One of the most iconic Noh masks is that of the Hannya, a jealous female demon with sharp horns, leering teeth, and piercing metallic eyes. The Hannya’s horns are so symbolic of jealousy that the traditional Japanese bridal head-wear is called the Tsunokakushi, or Horn Hider. All Noh actors are male. In most cases only the main actor (the shite) in a Noh play wears a mask. Sometimes the companion actor (the tsure) also wears a mask, especially when the character is female. Perhaps because of their ritualistic origins, Noh performers consider the masks to have inherent spiritual power. Some Noh masks are designed so that the slightest changes in the position of the actor’s head can express a wide range of emotions such as sadness, anger, and happiness. Because the actors wear the masks for long periods of time, they are carved out of lightweight Japanese cypress. The masks are decorated with natural pigments and lacquer on a base of glue and seashells, the rarest of them held in the private collections of the heads of the Noh schools and only displayed on rare occasions. The most ancient one is said to be held by the oldest Noh school, the Konparu, who claims the mask was carved by Prince Shotoku (574-622 B.C.). Menpo are what are known as samurai masks, designed to both protect their wearer and to strike fear in the enemy. 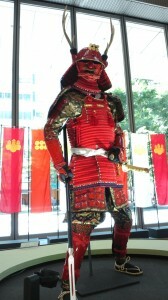 Added to the traditional samurai armor in the 16th century, menpo were made from iron and lacquered leather. They included details like fake teeth forming snarls and bristled moustaches to reflect the personality and preference of the individual samurai. 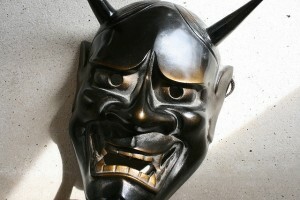 Other masks are traditionally used in local festivals or Shinto rituals. Oni (demon) masks, which have furrowed brows, short, spikey horns, and sharp fangs, are used during Setsubun, the day before the beginning of spring in Japan. On this day a “bean-throwing” ritual takes place at a local shrine or temple to cleanse the evil of the past year and drive away spirits that bring misfortune and disease. Generally, those born in the corresponding year of the Zodiac throw beans at the Oni saying “Oni wa soto! Fuku wa uchi!” or “Demons out! Good luck in!” At other times the Oni takes on a protective role, with men in Oni costumes leading parades to ward off bad luck. Kitsune(fox) masks are also used at festivals. Foxes are traditionally believed to be both messengers and servants of the rice god Inari and tricksters who can take on human shape. Frequently white with red details, kitsune masks are often worn in fall events, festivals dedicated to Inari and Kagura dances. Even the idol/metal band Babymetal has used a kitsune mask in their music video for “Megitsune” and held a live event in which fans wore fox masks. 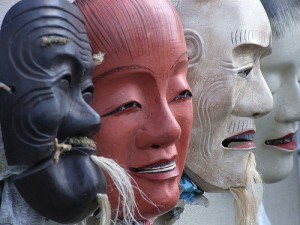 Masks have been a part of Japanese culture since ancient times. While the style and uses of some masks have shifted, others have remained largely unchanged for hundreds of years. Traditional masks can still be seen today in Noh theaters, traditional dance performances, and festivals. There are also modern interpretations in popular culture from music to manga all of which can be purchased in Japan. 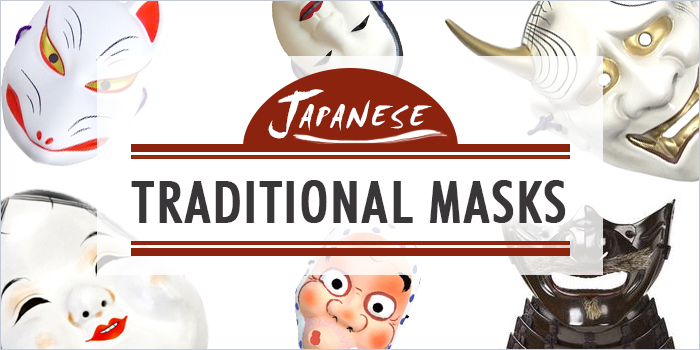 Check out the FROM JAPAN website to browse Japanese masks and other traditional items, so that you too can take part in Japan’s rich, artistic and ever-evolving traditional culture.